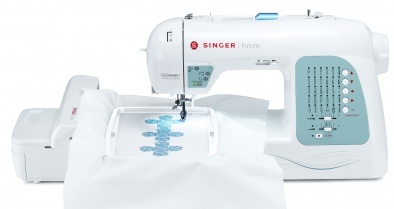 The new SINGER® Futura™ XL-400 sewing and embroidery machine: everything you love about your SINGER sewing machine, built right into an embroidery machine. It’s never been easier to add the personal touches that make your sewing projects shine. Automatic features make it easy to let your creativity lead the way! Find and download the manual. Now available in multiple languages! Needing help? Contact us and we can get you pointed in the right direction! Connect with other Futura fans on the Singer Futura Forum! Click here to sign up to receive news about machine updates, free designs and fun project ideas.